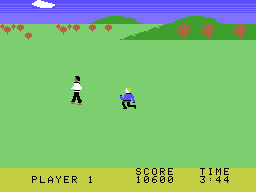 In this action game you play the part of Chuck Norris on a quest to reach a monastery where an important leader is kept hostage. 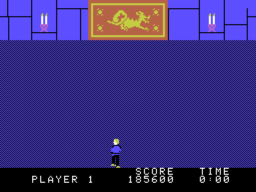 The game consists of several different screens: when beginning and between fights you will see a view of the path that leads to the monastery. 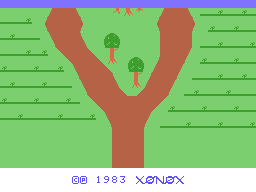 Walking along the path, you will encounter numerous enemies. When fighting, the view switches to a close up of your current location. 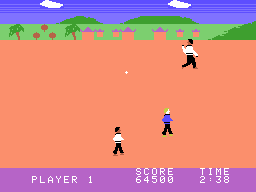 By pressing the joystick button and moving the joystick in one of four directions you can perform various kicks, punches, and blocks. 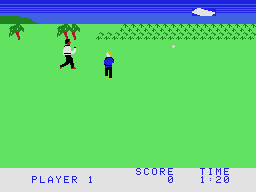 The enemies you encounter are varied, and some can only be defeated by certain moves. The path you walk along will occasionally split up into two or more choices; when this happens, only one choice is correct and the others are dead ends. If you choose incorrectly, you'll have to back track a bit and try again. Beginning as a white belt, you will slowly increase in rank as you win fights. 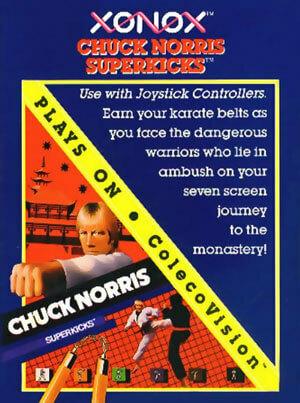 By the time you reach the monastery you need to earn black belt status in order to defeat the deadly ninjas inside! Your quest must be completed within a time limit, or the game is over. Walking off of the path or losing fights will also cause you to lose even more time.